Phakic IOLs are some of the latest additions to refractive surgery armamentarium. Phakic IOLs mean that the patients keeps the current natural lens that they have inside their eye and add on a new implant. This has a tremendous advantage for patients that are young and have the ability to accommodate. There are two types of Phakic IOL's currently approved by the FDA, the Verisyse and the Visian ICL. Many patients in past that had been denied refractive surgery because of too high of a correction or too thin of a cornea or mild corneal ectasia, may now be candidates for this revolutionary surgery. The Verisyse™ Phakic IOL is used to treat moderate to severe myopia, the medical term for nearsightedness. With over 20 years of use and 150,000 procedures performed worldwide, results prove that the Verisyse™ design is safe and effective for very nearsighted people who are tired of thick glasses and are not candidates for Custom LASIK. For better access to your eye, your doctor will use an instrument to comfortably hold your eyelids open during the procedure. A local anesthetic is given to numb the eye, so the procedure is virtually painless. A small incision is made in the cornea for the Verisyse™ Phakic IOL to be placed in the space between the iris and the cornea. The Verisyse™ Phakic IOL is centered in front of the pupil (the black part in the center of your eye), and is gently attached to the iris (the colored part of your eye) to hold the lens in place. A temporary shield will be placed over your eye to protect it during the time just after the procedure. One of the most important considerations in the evaluation of a patient for Verisyse intra-ocular lens, is proper sizing and safety distances. Current calculators provide a fair "best guess" measurement. 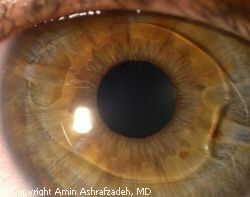 The Visante Anterior Segment OCT has demonstrated how invaluable it is in pre-operative and post-operative evaluations. One can properly evaluate the safe distance of the Verisyse from the inner lining of the cornea (endothelium) and the lens itself. These proper measurements are essential in avoiding future complications. The following is an Visante image of a prospective patient being evaluated for Verisyse. The above patient had Verisyse implantation with Dr. Ash with successful results. The image below is a confirmation that the above model is Visante Anterior Segment Imaging is in fact accurate and more predictive that the VeriCalc calculator that most surgeons rely upon. The lens-endothelial clearance measured by VeriCalc was 1.92 mm.